You can click on Video: Bruins bring Reading Rink to Thomas Crane Library to see a colorful video, along with a wonderful article with some still pictures as well from our fun event yesterday. Thanks to Dan McCready of the Patriot Ledger for capturing the spirit of the day, and to the paper for spreading the word! There's always something exciting happening at the Thomas Crane Public Library! 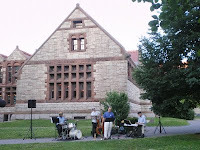 Community bulletin board - The Boston Globe lists Thomas Crane Public Library's "Quincy Unplugged" open mike (mic?) night that takes place tomorrow, Monday, July 25th. 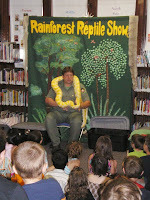 It's everyone's chance to share their talent in front of a friendly, encouraging audience. 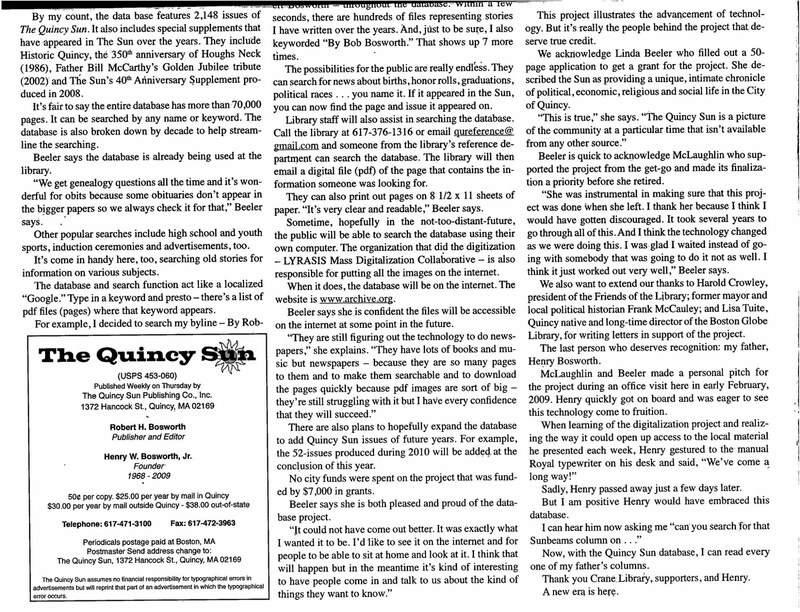 In the "Community Briefing" on page 3 are news items of on- or ahead-of-schedule Public Library Construction Projects in Walpole and Westwood. Congratulations to Directors Sal Benovese and Tom Viti! The Brockton Symphony Orchestra, founded in 1947, performs with between 60 and 70 musicians during their concert season from the beginning of September to the beginning of May each year. This year, the group was chosen to be featured in the Mashpee Night at the Pops concert on July 30, where the symphony will perform for an expected crowd of 10,000 people. 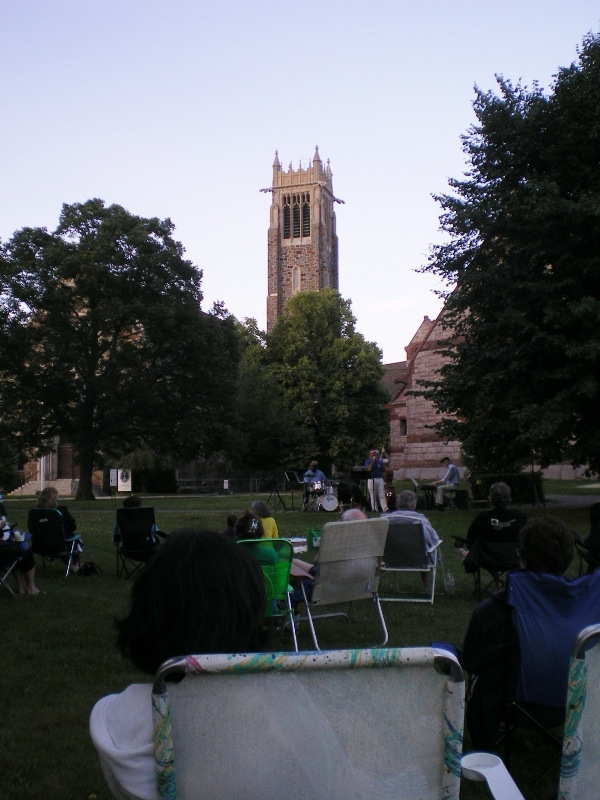 The orchestra will play 21 pieces over three acts, plus three pieces during the fireworks, and will collaborate with Brockton’s Jubilate Chorale. “We are extremely excited,” says chairman and clarinet player Torben Hansen, “It is a great opportunity for the symphony. 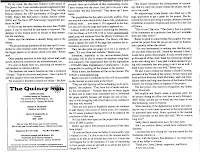 It’s a real boost for us.” Flutist Susan Caplan says, “It is fun to collaborate and support local groups,” and she adds, “We’re definitely a family.” Directions for donating to the orchestra and for purchasing tickets to the Mashpee Night at the Pops and the symphony’s other six concerts scheduled this season are at the group’s website www.brocktonsymphony.org. I counted 113 people (plus 3 canines) at one point during the second in the Concerts On The Lawn series at the Thomas Crane Public Library last night. 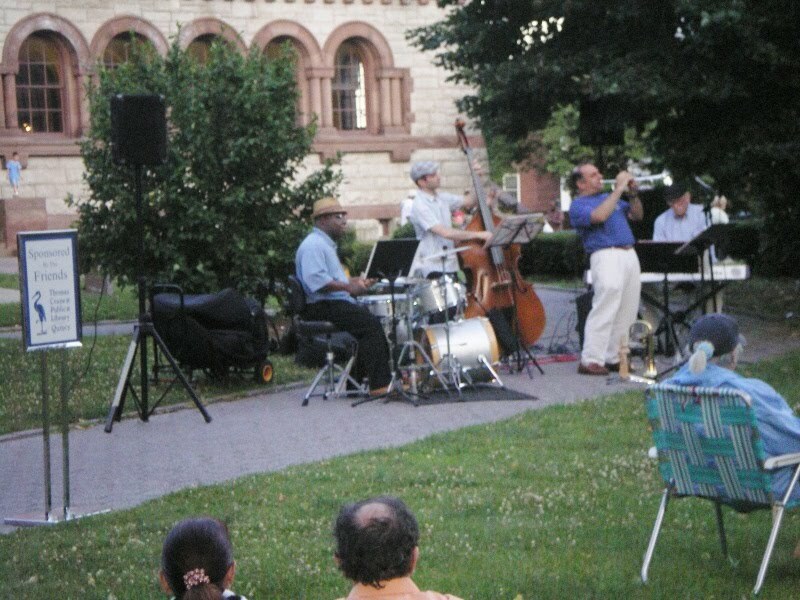 Feet were tapping and hands were clapping to the Black Sea Quarter, a downsized version of trumpeter/singer/songwriter Dan Teager's 15-member Black Sea Salsa Band. In honor of Bastille Day Dan sang several songs in French. 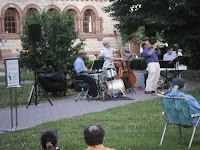 He described his fusion of traditional Armenian music with pop and Caribbean rhythms. This program was made possible by the support of the Friends of the Thomas Crane Public Library. 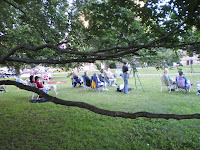 Just as last week, the audience was rich with families and many of the children played nicely on the lawn, adding to the "picnic" ambiance of the event. A pleasant time was had by all. 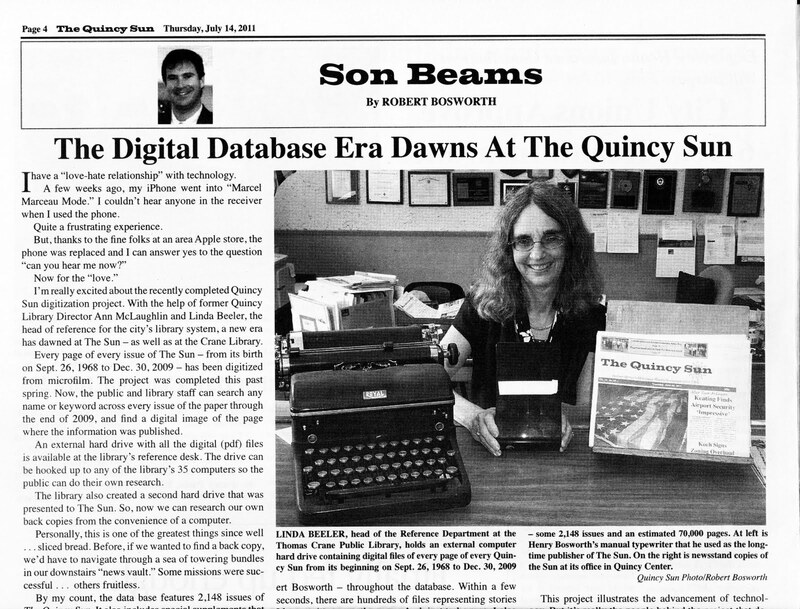 Thank you Robert "Bob" Bosworth for a full-page article honoring Linda Beeler and the Reference Staff at the Thomas Crane Public Library in Quincy, Massachusetts for a project that will serve the Quincy Sun newspaper, the Library, and genealogists and other researchers studying Quincy, for years to come. This is a wonderful example of how rapid advances in information technology put public libraries right in the middle of the action. The announcement of our obsolescence was decades, if not centuries, premature. 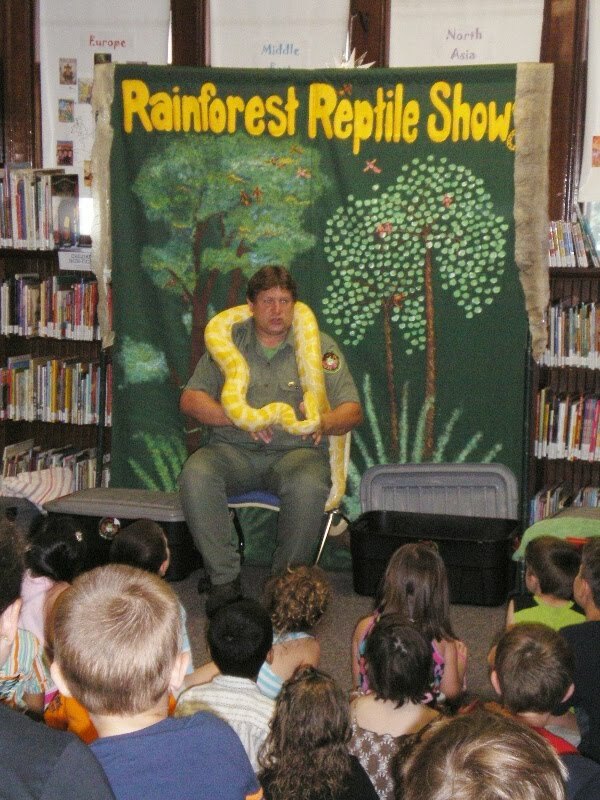 Michael Ralbovsky of Rainforest Reptiles Shows thrilled an audience of fascinated children with some amazing - including some amazingly large - animals. Michael is a scientist and an ecological activist who shares his information in a winning way that warrants the title "Entertainer" as well. The show was as the Wollaston Branch Library. 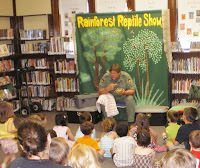 At the end of the show children and a few parents crowded around for a chance to pet a critter, or watched taratulas and hairy spiders having a snack. 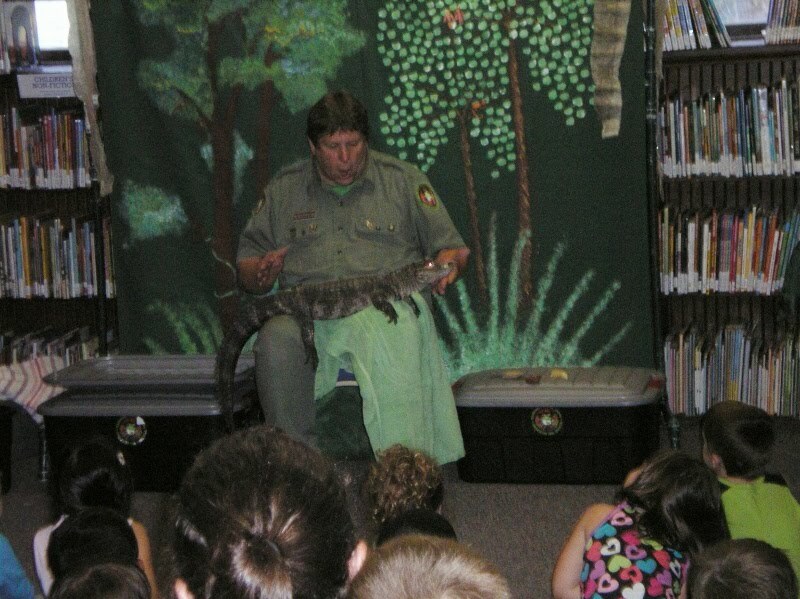 While all this was going on Miss Amanda held back (afraid of snakes, she said) while Miss Barbara checked out books to a steady stream of "regular customers." 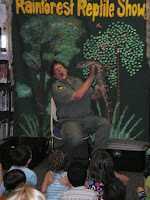 A typical wonderful busy summer day at the Branch Library.